For those who dream of a night at the museum, a little more time uninterrupted in a gallery or a completely unique stay, the Good Arts Building has you covered. 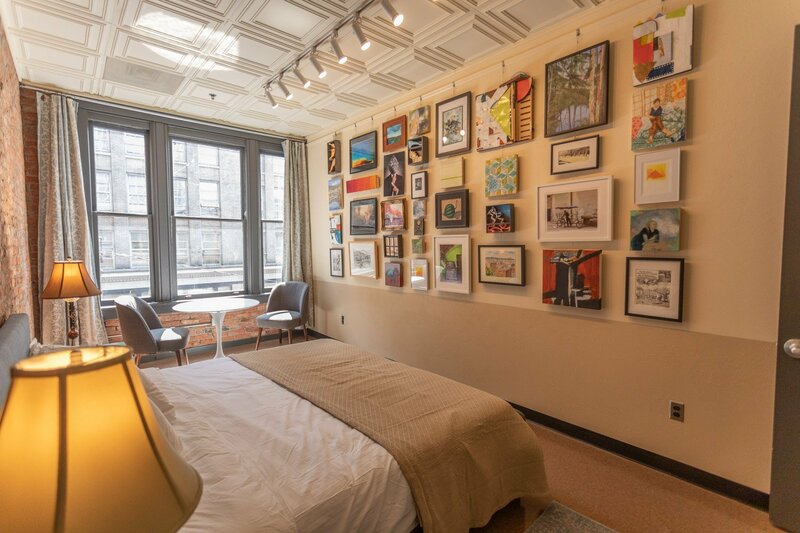 A new Airbnb room, with space for up to two guests, is opening its doors in the ’57 Biscayne studio complex located at 110 Cherry St. in Pioneer Square – just in time for Seattle Art Fair. Named “Salon Rue de Cerise,” the space was inspired by Gertrude Stein’s living room on the Rue de Fleurus, with its walls hung floor to ceiling with paintings by as-yet-unknown artists, an inspiring space for conversation and new ideas. By staying for the night, guests will also be lending a helping hand to the local art scene. Overnight rentals will help subsidize the building’s art studios – unlike other Airbnb units, which have drawn criticism for replacing affordable housing. Typically (and even stereotypically), artists give a boost to a struggling area and are later priced out. Instead, at the Good Arts Building, Richlovsky is creating a new model, one that encourages creatives to stay in the neighborhood they revitalized. The Good Arts building has a rich history, entrenched in the arts, to maintain, after all. There once was a world famous jazz club in its walls, a fringe theatre in its basement and a photography studio in the halls. It also housed a boxing gym and the first gay and lesbian community center in Seattle. Richlovsky and other studio artists are hanging a secret art show in the Airbnb room. Only guests will be able to view and purchase the work, priced affordably, through an online store and have it sent to their homes. Guests staying at the Salon Rue de Cerise will receive a binder of recommended stops and experiences in Pioneer Square – as well as a few special options in nearby artists’ studios and retail boutiques. Richlovsky has maintained a studio in Pioneer Square since 2001. She founded ’57 Biscayne in 2011 to offer affordable workspaces for her fellow evictees of the storied 619 Western arts building and also to maintain the presence of artists in Pioneer Square. She took advantage of the neighborhood’s then low rental rates and her DOT relocation funds to secure the second-floor master- lease specifically to provide affordable art studios. “In Seattle, as in so many cities across the country, artists and arts businesses have set the foundation for struggling neighborhoods to transform into highly desirable real estate markets, only to be priced out of them once this happens,” Richlovsky said. In 2015, the artist-developer partnership Good Arts LLC formed to buy the entire building, to keep the artists in Pioneer Square and to provide additional affordable space for the creation, promotion, and exhibition of a broad range of artistic endeavors. In keeping with its mission, the Good Arts Building recently repurposed its third floor – once office space for the tech industry – into more studios. Want to stay in the Good Arts Building? Book it here.